Using two of the newest appliances from BLACK+DECKER and George Foreman, Food Network Star and Celebrity Chef, Jeff Mauro, has created two easy, comforting recipes. Salt and pepper steaks and let them sit out at room temp for 30 minutes. Using the grill plates, preheat the George Foreman Grill & Broil to 425 degrees. Grill steaks to medium rare, about 120 degrees internal temp, or for about 8 minutes. Once done, set aside to rest for 15 minutes before slicing steaks against the grain with a very sharp knife as thinly as possible, cutting around large chunks of fat. Place back on plate with any reserved juices and tent with foil. Meanwhile, toss sliced cremini mushrooms and onions with oil, granulated garlic, salt and pepper in a bowl. Switch the bottom plate of the George Foreman Grill & Broil to the griddle and sauté the mushroom and onions for 10-12 minutes or until caramelized. 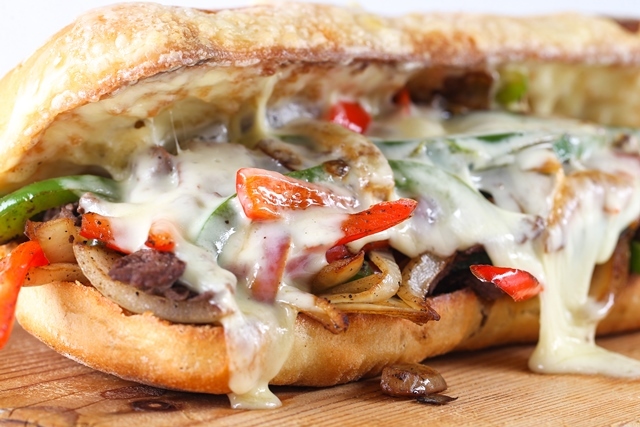 Set aside and remove the top plate of the George Foreman Grill & Broil to expose the broiling element and set to “high.” Before finishing off with the broiling function, build your sandwich, ribboning thinly sliced ribeye and then veggies on the bottom of the sub roll before topping with two slices of sharp provolone. Place the sandwich back into the griddle plate on the George Foreman Grill & Broil and broil each sandwich until cheese is golden and bubbly. Top with sliced cherry peppers and serve! Begin by dicing the onions and potatoes, and julienning peppers using the BLACK+DECKER Multiprep Slice ‘N Dice, setting the onion and peppers in one bowl and the potatoes in another and set both to the side. In a large skillet, cook the Mexican chorizo over medium high until browned and cooked through, about 12 minutes. Removed from pan and drain, reserving 2 tablespoons of fat. Using the same skillet with reserved fat from the chorizo, add onions, peppers, cumin and chili powder. Season with salt and pepper and sauté until soft and slightly browned, about 10 minutes. 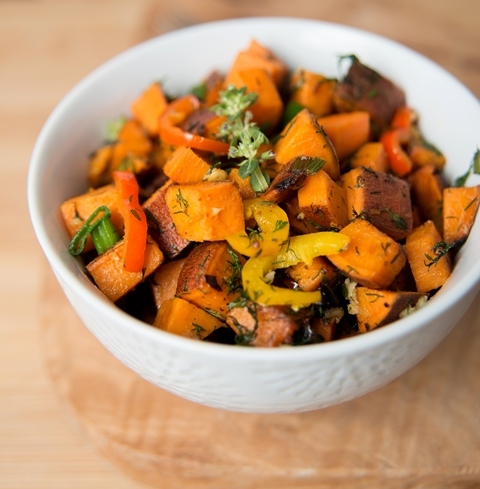 Turn heat up to medium/high and add in sweet potatoes, season again and sauté, only stirring or tossing every couple minutes, until dark brown color develops, about 8-10 minutes, adding the drained chorizo back into the pan 2 minutes prior to serving to reheat. Season with salt and pepper to taste, garnishing with several small dollops of Sambal Oelek and sprinkling with fresh chives.